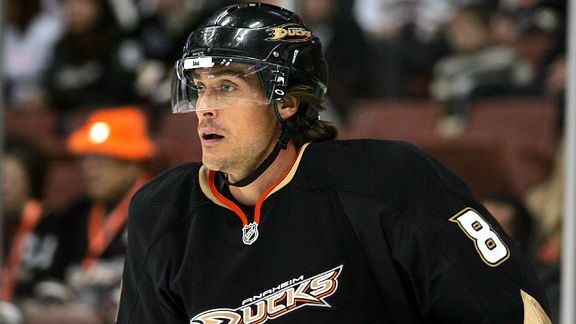 The Anaheim Ducks announced they have reached a one year, $4.5M agreement with Finnish forward Teemu Selanne. As everyone expected, Selanne resigned with the Ducks where he has spent a majority of his career. There was almost no chance Selanne would’ve signed elsewhere as his entire family is settled in southern California and ending his career with the Ducks is a perfect ending to a Hall of Fame NHL career. The decision for Selanne was to either retire or play another season in Anaheim. This season may indeed be Selanne’s last. He’s been contemplating retirement for the past few seasons but the love for the game and his ageless body have kept him from retiring. He has won the Stanley Cup once and is hoping for just one more chance to lift Lord Stanley again. Though Selanne just celebrated his 42nd birthday this month, Selanne can still produce points and be effective for the Anaheim Ducks. Selanne has averaged 62 points over the previous four seasons with 48 being the lowest amount even though he missed almost half the season due to injuries. The Ducks struggled this season, finishing 13th in the Western Conference and 15 points out of the playoffs. The Ducks will rely on Selanne for offense along with the big three of Corey Perry, Ryan Getzlaf, and Bobby Ryan. Selanne will also have a leadership role in the locker room mentoring and helping younger players. The Ducks have bolstered their roster this offseason in attempt to be more competitive in the West. They’ve added right wing Brad Staubitz along with defensemen Bryan Allen and Sheldon Souray alongside resigning Selanne and defenseman Matt Smaby. If the Ducks big names can put up big numbers this season, expect the Ducks to be fighting for a playoff spot this upcoming spring. Will this upcoming season be Selanne’s last NHL season before retiring? This entry was posted in News, Trades, & Signings and tagged Anaheim Ducks, Bob Murray, Bobby Ryan, Correy Perry, Ryan Getzlaf, Teemu Selanne. Bookmark the permalink.